Types of data Chimera displays. 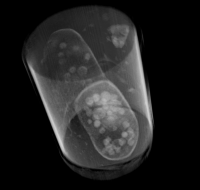 Demonstration segmenting x-ray tomogram of dividing S. pombe cell. 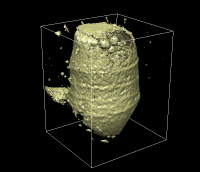 Is Chimera the right software for x-ray tomography? 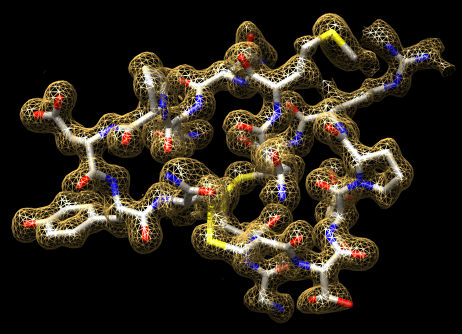 Interactive visualization and simple analysis of 3-dimensional data. 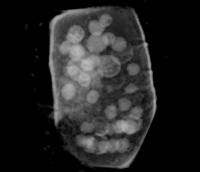 X-ray tomogram of dividing S. pombe cell provided by Dula Parkinson. 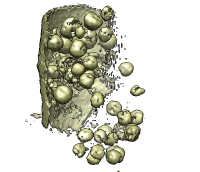 Dividing S. pombe (yeast), tilt angle 0. Segmentation. 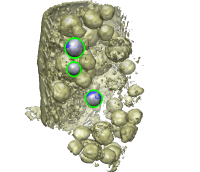 Vesicles colored by density: high to low red, yellow, green, blue, black. Nucleus is orange. Chimera, Amira and IMOD have many overlapping and many unique capabilities. All are well documented and time-consuming to learn. 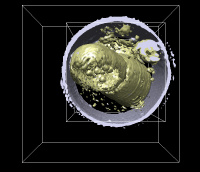 Electron microscopy labs often use all 3 programs -- one primarily and others to fill gaps. Availability of in-lab experts is a key factor in which program is most effective. Who the program is designed for greatly effects utility. Easy to use. Free. Extendable. 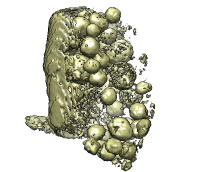 Good 2D plane by plane data analysis and segmentation. 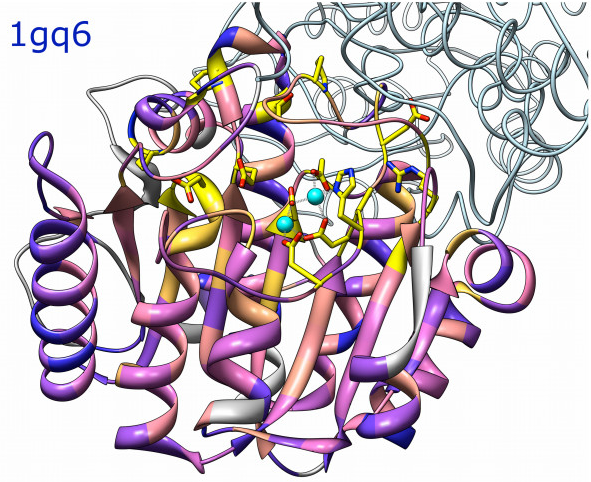 Map capabilities developed for electron microscopy at molecular resolution. High cost per machine license. Commercial vendor may focus on large customers' needs (medical imaging). I have not used the program enough to evaluate it. Runs on Windows (including Vista), Mac (including Leopard), Linux. Show original tilt series data, pombe21.tif, 90 image multipage tiff file. 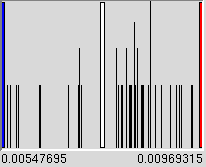 of histogram at top, rightmost one not quite at right edge to eliminate border. 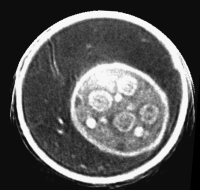 Chimera does not calculate tomograms from tilt series. Can make movie from tilt series. cell at bottom for many view angles. Adjust surface threshold lower (~ 0.005). Adjust step from 8 to 2.
for tomograms which are noisier and have less even brightness. Switch to solid mode, step 4, adjust middle threshold ~.007, low to 0.003. Rotate. Switch to step 2 for nicer detail. through range of planes (much faster than Play since planes are skipped). Move lower threshold to zero and height 1/4 to see low signal features. Switch to y axis plane and drag slider. Remove pipette by masking out (setting to zero) volume outside cylinder. Switch to surface, step 4. 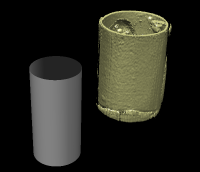 Create cylinder with command "shape cyl" using one command shortcut oc. 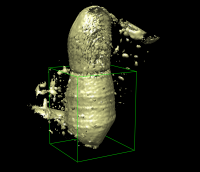 Change color of map (light yellow) to distinguish cylinder. Resize cylinder by selecting and using sz shortcut and button 3 drag. and aa activate all, or at active toggle, shortcut or orthographic projection. 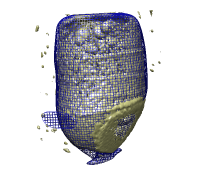 Mask to cylinder, one command oc, "mask #0 sel", hide surface hs. Made map smaller. Show outline box, original map outline box, then unshow. below 256, so does not help in this case. Align volume grid with axis of two cells. Helps with plane by plane display. 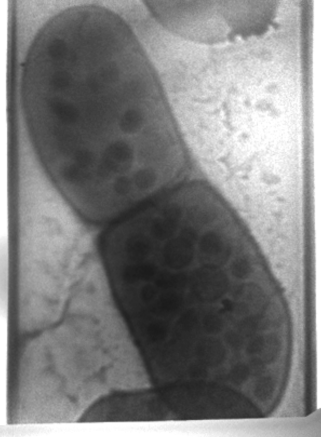 with higher density cell including membrane separating cells. 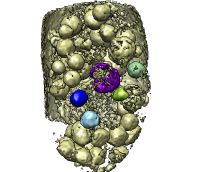 Drag box sides in close to cell membrane. 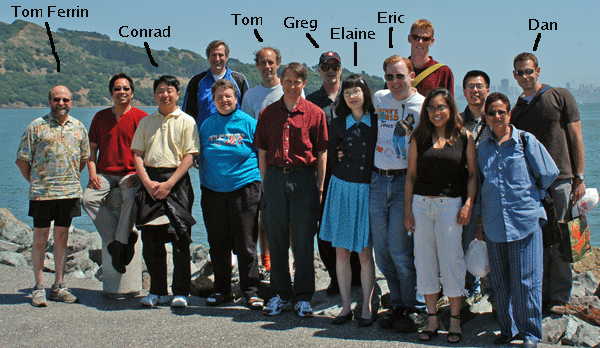 hide subregion selection panel, raise threshold to see inside, step 2, step 1.
width 2. Back to black, no edges. 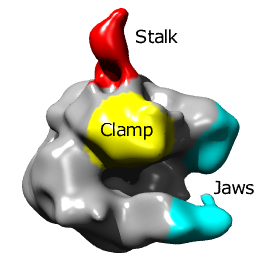 Show plane display along z, now aligned with long cell axis. rock by hand, hide planes panel. 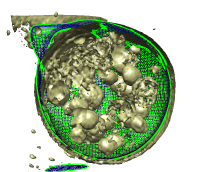 Remove cell membrane to get a clear view of vesicles at low threshold. Use same surface masking done for pipette removal, only shape is harder. 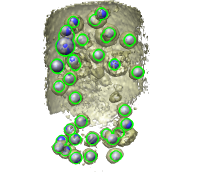 Use Gaussian smoothed data to get the cell membrane shape. Use Gaussian width 20 voxels. Low threshold 0.004, blue mesh, step 2. Toggle selectability (ts), select blue, scale with mouse (sz) to fit inside. Mask to remove cell membrane "mask #4 sel", hide blue mesh. Enable silhouette edges, width 2. 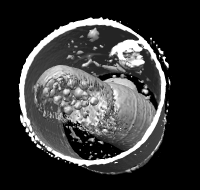 Can now use low surface threshold and see hollow vesicles without blocke view. 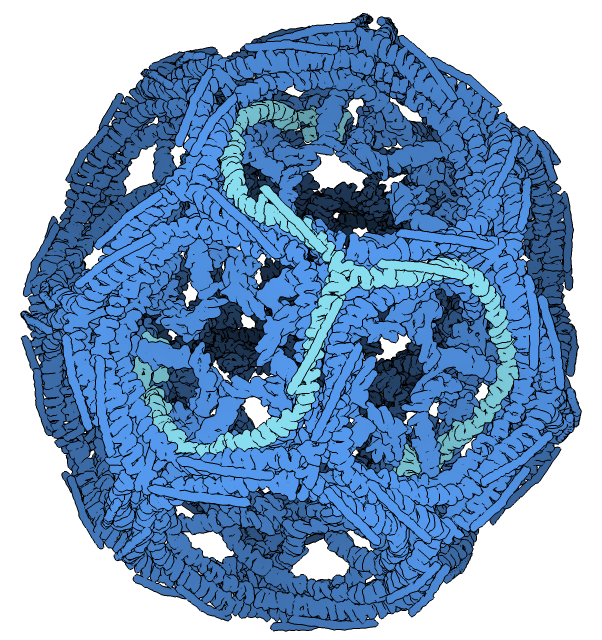 Use step 2, point out a hollow large vesicle near center. 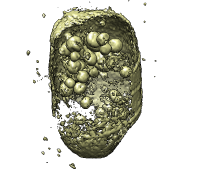 Next want to mark individual vesicles. Can color and measure volume of connected blobs. Color several different colors. Choose disconnected ones. Threshold 0.00645.
spacing to 20 nm, then volume would be reported in nm^3. Connectivity only sufficient for coloring well isolated blobs. coloring. Change threshold and show color vanishes. 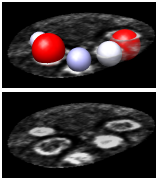 Use a more flexible approach of placing spherical markers on vesicles. color dark blue for contrast. Adjust mouse mode to move markers, turn off linking. 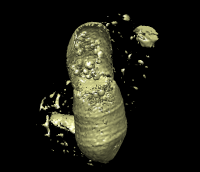 Move marker to center of vesicle and resize (alt + mouse drag). threshold place a few more. much time by moving many in one view. 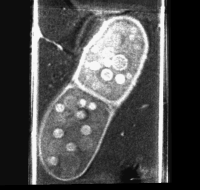 Open a marker file with centered and sized markers on all vesicles and nucleus. 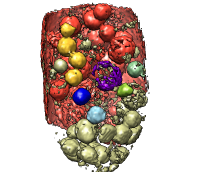 Coloring in movie was according to average density within vesicles. 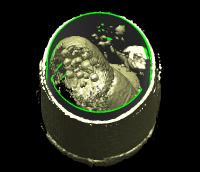 Chimera doesn't have a builtin tool for measuring average density in spheres. But a Python a one page script can do it. Might show it, explain blocks. histogram and color markers by average density after unselecting nucleus. Show mesh to increase transparency of map. densest red markers and nucleus. Probably a map handedness problem. of marker radius over ave density inside 80%. Indicates hollowness. 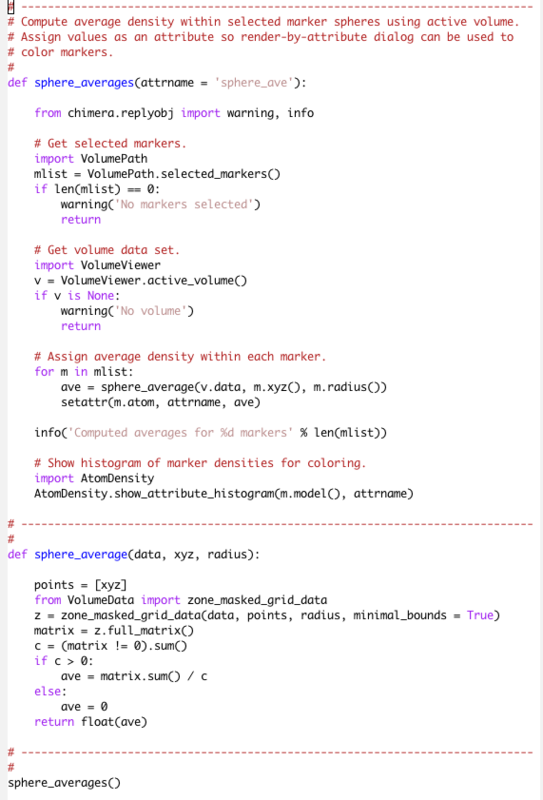 Open script, color with render-by-attribute.